Purpose of Committee: The Sam Houston State University Newton Gresham Library uses social media as one method to promote the Library and its' collections & services for SHSU students, staff, and faculty. 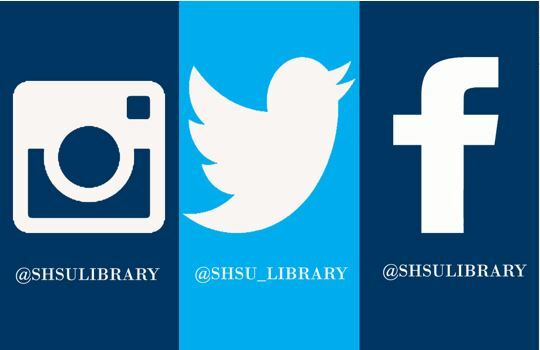 We welcome social media post ideas on current events and topics, SHSU and local events, literary celebrations and any other topics relevant to the Library. The Committee meets on the 2nd Monday of each month. Each committee member will serve a term of two (2) years. A Chair-elect will be chosen during the 12th month of the Chair. Channel administrators are volunteers, or are assigned based on the preference of the chair. Chair and chair-elect will be channel administrators. New members are assigned by the library executive director, and you may be asked to extend your term if needed. Each committee member is assigned three (3) days per month to draft posts for all three (3) social media platforms. A minimum of two (2) different topics should be highlighted per day so that there is a variety of content from all library social media accounts. Advertise Library Events/ Displays or University Events - 1 post should advertise library events/displays or University events. Always include the social media handle of any sponsoring college or departments with these posts (ex. @SHSUCJ is College of Criminal Justice). #PundayMonday - 2 posts per month featuring library/literary memes, comics or puns (2nd & 4th week of month). Please compose posts that encourage diversity, cover current events, and are tied to #SHSULibrary resources and/or mission.